This Policy covers the website www.verneide.com and subdirectories. If you have questions or concerns regarding this Policy, you should first contact at the information below. What information does Vern Eide collect? As part of the vehicle research and purchase/lease process, information such as your e-mail address, name, and contact telephone numbers will be requested. In addition, the same information, as well as credit card or other payment information and billing and shipping addresses, will be requested when you purchase parts and/or accessories via our website. This information may be used as described below. Motor Vehicle Search/Inquiry. When you enter information on our website, it is transferred automatically to Vern Eide's client relationship management (hereinafter "CRM") system. This CRM system will establish a customer record for you and enter the information you provide so that your inquiry may be answered promptly by a Vern Eide representative. Vern Eide provides for limited access to the CRM system, which is a secured application accessed by entering a valid username and password. Once you have expressed interest in being contacted, a representative will respond through a personalized email or phone call or other communication. After the initial contact, there may be several points of communication between you and the representative by either telephone or email or other communication. At any point in the relationship you have the option of indicating by either telephone or email that you no longer wish to be contacted by Vern Eide. In this event, a representative will access the CRM system and mark your customer record as ''closed'', at which time, you are removed from ''active'' status. Your information, however, will not be deleted unless you specifically request, in writing, that we do so. If you subsequently contact Vern Eide again, your customer record will be reinstated to "active" status and you may subsequently be contacted by Vern Eide. If you express interest in financing a vehicle (whether a loan or a lease), additional information related to creditworthiness will be requested by Vern Eide. This credit information be used only in compliance with applicable federal and state law. Purchase of Parts/Accessories. When you enter information into our website for purposes of purchasing parts or accessories, such information will be used to process and fulfill your purchase and otherwise in accordance with this Policy and applicable law. Vern Eide uses a technology called "cookies". A cookie is a small piece of text that you can agree to place on your computer's hard drive. In most cases, you can set your web browser to prompt you when a cookie request is being made from a web page, such as our website, and you have the option to accept or not. If you accept or do not reject the cookie, then your browser adds the text in a small file on your hard drive, which will expire in 90-days. Accepting cookies in no way gives us access to your computer or any personal information about you. It is a method of storing information to improve your online experience. It will assist us in making your site visit easier and more efficient. Note that personal information is often contained in or linked to a cookie (such as email address, zip code, etc.). Vern Eide receives such information if you at some point volunteer it by typing in the information on the website. The use of the personal information is limited to being contacted by a Vern Eide representative as described above, or in connection with financing (if requested by you), except as otherwise described in this Policy. We publish special promotions, pricing promises, brand name and various other messages on the internet to help consumers find and contact Vern Eide. In order to determine which method is most effective, a cookie is used to capture which method was used to find our website. The information included in such a cookie identifies to us the message that you used. Does Vern Eide track my visits? This website uses a third party tracking service provided by R.L. Polk & Co. to collect non-personally identifiable online demographic and behavioral data generated by website visitors. A data collection script provided by this service and installed on our website collects the following kinds of data: all your website session activity, including your personally identifiable information when entered into a form field such as name, phone, email, or when you arrive at our website through a link containing a unique identifier; links that you click, pages that you view, form fields that you select, and text fields that you enter. The information is used to compile your shopping activity to produce an individual shopping profile for you, which contains information about your brand preferences, and to aggregate your website behavioral data in anonymized form with all other visitors' anonymized shopping activity data on our website to help us analyze industry trends, general shopping patterns, overall consumer demands, and website performance. If you desire more information about this service, please visit https://www.ihs.com/btp/dataium-consumer-information.html You may opt-out of this data collection by clicking on this opt-out link https://cdn.ihs.com/www/dataiumprivacy.html and then following the prompts. How is email used by Vern Eide? Price Quote - if a customer clicks on "price quote" or a similar link or field in the Vern Eide website or certain Vern Eide supported online ads or links, an email address is requested. In accordance with various state laws, a specific price quote can only be offered to a unique individual - not to the public at large. In order to provide you with a price quote on the site, you must first identify yourself as an individual by entering your email address. Contact Form - if a customer wishes to be contacted by a Vern Eide representative, the customer completes a form that includes a request for his or her email address and other information. Purchase of Parts/Accessories - if a customer wishes to purchase parts or accessories through our website, the customer completes a form that includes a request for his or her email address and other information. When an email address and other information is provided, the customer voluntarily submits his or her email address and other information in order to receive follow up information, a specific price quote, fulfill an order for parts or accessories, or establish a relationship with a Vern Eide dealership or representative. Each email you receive from us will contain an opt-out link which can be used in the event that you no longer wish to receive communications from us. There are opt-in links on our websites should you wish to receive promotional communications from us in the future. And our email communications contain a link that can be used to opt-out from further email communication. Does Vern Eide share any information it collects with outside parties? Our affiliates are other companies in the Vern Eide group of companies. In addition to using affiliates to perform services, we may share your information among our affiliates. Does Vern Eide provide a way to update or remove personal information? A customer wishing to change, update, or remove personal information may do so by contacting the applicable Vern Eide dealership or representative either by email or telephone and stating their wishes at any time. The relevant contact information can be found in the initial email response you received from our dealership. Use of any other contact or communication method may not result in the personal information being changed, updated, or removed. Why are we telling you all this? Because Vern Eide is a firm believer and active participant in consumer privacy, we maintain this Policy to give our visitors disclosure of our privacy practices and policies. Vern Eide believes in improving the customers' online shopping experience through the responsible and secure collection and usage of customer data. As a condition to using the Vern Eide site, we require that you approve our collection of the information described in this Policy. By visiting www.verneide.com or respective subdirectories you agree that we may collect and use this information as stated in this Policy. If we change this Policy, we will post the changes on this web page so you are informed about what information we collect, how we use, and under what circumstances we disclose it. If we decide to change this Policy, we will post those changes to this Policy, and other places we deem appropriate so that you are aware of what information we collect, how we use it, and under what circumstances we disclose it. At Vern Eide, we've taken important measures to keep the information you share with us safe and secure. As required by law; to facilitate your transactions on this website (such as purchases of parts or accessories) for which you have submitted such information; or as otherwise described in this Policy and permitted by applicable law. Despite all the security measures taken, the internet is not a 100% secure environment. Vern Eide does not warrant or guarantee the security of any information you transmit to its website. Vern Eide does not and cannot guarantee that the physical, technical, or managerial safeguards maintained by us or our third party service partners will never fail or be breached. When applying for motor vehicle financing (whether a loan or a lease) on the Vern Eide website, your credit application is sent directly to the dealership that you have chosen. The credit application is securely collected and transmitted using SSL technology that encrypts your personal information as it travels over the Internet. At Vern Eide, we take your privacy very seriously. We know that information about you and your finances are sensitive. 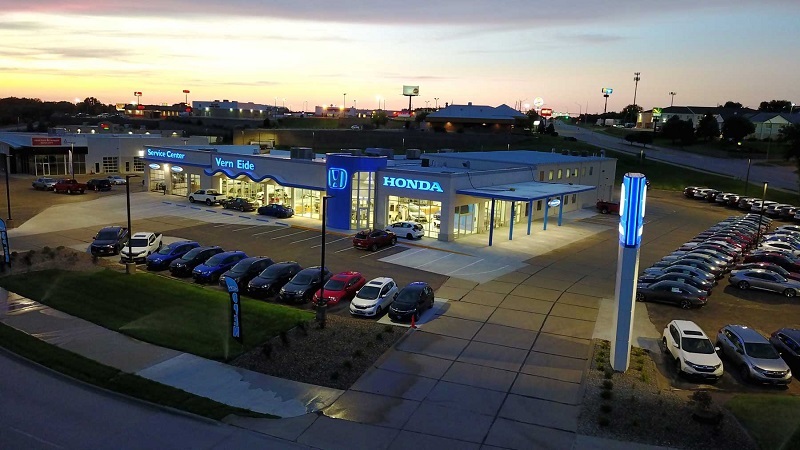 As we point out in the Consent Statement you must read before submitting a credit application, your credit application is submitted to the Vern Eide dealership closest to the geographic area represented by the zip code you enter on the application. Only authorized personnel at the dealership have access to your credit application. We may ask you for your contact information, such as name, address, phone, and email address; your financial information, such as monthly income, amount of debt, monthly rent or housing payment; and sensitive information such as date of birth and social security number. By submitting your credit application, you are giving consent to the applicable Vern Eide dealership to investigate your credit and employment history. A credit report may be obtained in connection with your application for a renewal or extension of credit for which application was made. Upon request, you will be told if a credit report(s) was/were obtained, and given the name and address of the credit reporting agency(ies) providing the report(s). Your credit information may be shared with third party lending institutions that have a business relationship with the applicable dealership for the purpose of providing motor vehicle financing. Once you have completed and submitted the credit application, you will be presented with a "Thank You" page, which discloses the address and phone number of the applicable dealership. It is suggested that you print this page by pressing the print button on your browser. In the event that you have any questions or concerns regarding your credit application, please contact the dealership and ask for the Internet Sales Manager. We reserve the right to disclose your personally identifiable information as required by law and when we believe that disclosure is necessary to protect our rights and/or to comply with a judicial proceeding, court order, or legal process served on our website. All such disclosures will be in compliance with applicable law. The security of customer information is very important to us and we take a number of steps to safeguard it. We maintain physical, electronic, and procedural safeguards that comply with federal standards to guard nonpublic personal information about you. We limit access to personal and account information to those employees and agents who assist us in providing products and services to you. Employees who fail to follow our established standards are subject to disciplinary action. We also require third parties to whom we disclose nonpublic personal information to adhere to generally accepted privacy policies and practices and to establish information security procedures. This Policy applies to our website users and this Policy replaces our previous disclosures to you about our information and privacy practices. We reserve the right to disclose, assign and/or otherwise transfer information in our possession together with any and all of our rights and obligations hereunder in connection with the sale or assignment of all or substantially all of the assets of a Vern Eide company or the sale, assignment, or termination of any franchise or dealership, whether by way of merger, acquisition of stock or assets, consolidation, amalgamation, reorganization, foreclosure, operation of the law or other similar business combination transaction.